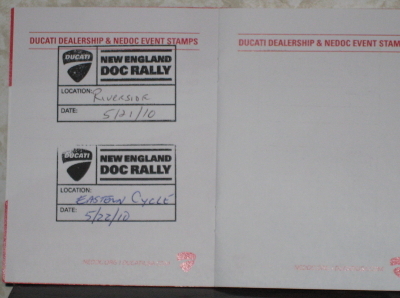 The New England Desmo Owners Club Passport Rally is, essentially, a friendly competition and excuse to get out and go riding all over the northeast. This is the second year of what we hope to keep going as a running (and growing) event. The rules are pretty simple: ride to as many of the participating dealerships and events as you can and get your passport stamped at each one. 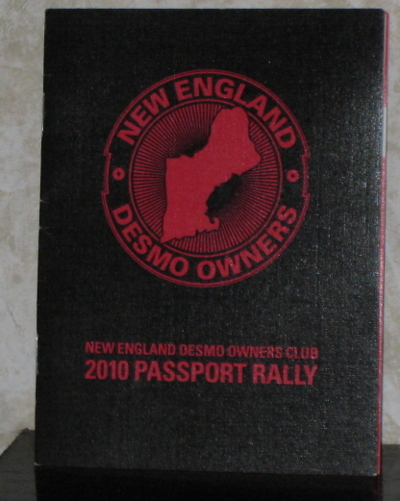 At the rally in September everyone turns in their passports and the person with the most stamps in each category wins. This year they’ve added another way to earn points by submitting pictures of our bikes with our passports in front of certain landmarks spread throughout the region. All in all it’s a lot of fun, and finding as many of the places as possible makes for great adventures. For last year’s rally I did a 3-day romp through 5 states collecting stamps as I went, and I’m planning at least 2 or 3 trips for this year. 2 stamps down, a whole lot to go! that sounds absolutely amazing! what do these stamps look like? I like the idea of moto-adventure stamps! Don’t you love summer?! This sounds like such fun! Oh, it’s a lot of fun! The stamps are rubber stamps like you’d have in a real passport. What a joy to find such clear thinking. Thanks for potisng! So. This week I met them for the big visit, and we made our way across a field to a creek bed at the edge of the woods. I’m not sure what the eagle prerequisites are for real estate, but this pair had set up house at the top of a very scraggly pine tree. Although large, the nest was not easy to find; you had to know where to look. Once I was pointed in the right direction, I pulled out binoculars and was able to see a large black bird sitting in the nest: Baby! The adult eagles were nowhere to be seen. We moved west of the woods line so that we could get a closer look – and by “closer,” I mean that we were still a good 150 feet away. This, however, was too close for Mama and Papa, who arrived out of nowhere. I can’t describe what I felt in seeing two bald eagles soaring overhead. I was, and still am, awestruck. They moved fast, and I had to anticipate their flight path in order to see them with the binoculars. As I gave myself vertigo trying to follow them in the sky, my friend – a wonderful photographer – snapped frame after frame with his camera. The eagle pair made “clicking” sounds and then resorted to a cry resembling that of a gull. Clearly, they were upset and trying to chase us off… although my friends surmised that the adults may just be trying to ascertain whether they could “pick off the small one” (that would be me!) Meanwhile, back at the nest, Junior knew his parents had returned and sat with his mouth open, waiting. We didn’t stay much longer. As we crossed the creek and headed back uphill, the adult eagles followed us overhead to make sure we were leaving. By the time we neared the road, they had returned to the woods. I’ve seen hawks, of course, and ospreys while kayaking – a Great Horned Owl even lives nearby – but this was the first time I’ve ever seen a bald eagle in its natural habitat. what an amazing and opportune adventure! wow, that sounds great! the picture is beautiful, is it one of the ones that your friend took? Yes – he’s an incredible photographer, isn’t he?! I tire of all the vixen-villians in romance-suspense-thrillers that explain their unorthodox behavior with the adage, “Love makes you do crazy things”. It’s not that I think it trite or that I take issue with the storyline. Rather the sentiment is wrong. Love does not make you do crazy things. Love makes you do mechanical things. Love makes you buy flowers and exchange mixed tapes and read poetry. There is a very scripted formula. Instead, I might be more apt to empathize with these vixi-villians if they changed one word to make the adage a well adapted mantra. It’s loneliness that makes us do crazy things. When lonely there is no greater time and better opportunity for crazy, and because there is no script for loneliness, I found great adventure potential in it. So for my fifth week, it all started in Salem and ended in Brazil. Wow! I could read your blogs all day! You are indeed a writer yes? What an empowering and insightful experience. Thank you for sharing! Thanks everyone! It’s good to stand up to goons! Bravo! I am working on being more assertive, and this is a fantastic (and beautifully written) lesson. Addendum to this story: Mr. Josh contacted me today to ask….. for his books back. I think I’ll leave them in a rain puddle, on the interstate. Nearly two months out, but I’m reading older posts…I left a guy’s books propped against his garage door, along with a CD containing only “S*** Song” by Kate Nash. It felt good. I’m an academic advisor, so I’m used to students asking questions of me. Many of their questions are the same, and many of my answers are the same. 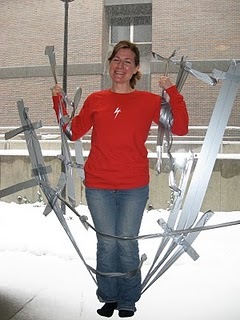 Two Fridays ago, however, I experienced a significant break in the monotony … I was asked by two first-year students I advise to consider being duct-taped to a window for educational hijinks (that is, Engineering Week festivities). And my answer was quite unexpected too. After a quick glance at the 52 Adventures logo that’s next to my computer screen, I said yes. So, on the following Monday, I arrived at Zimmer Hall, ready for my taping. Along with 18 other people, I was taped to a window, quite strategically. 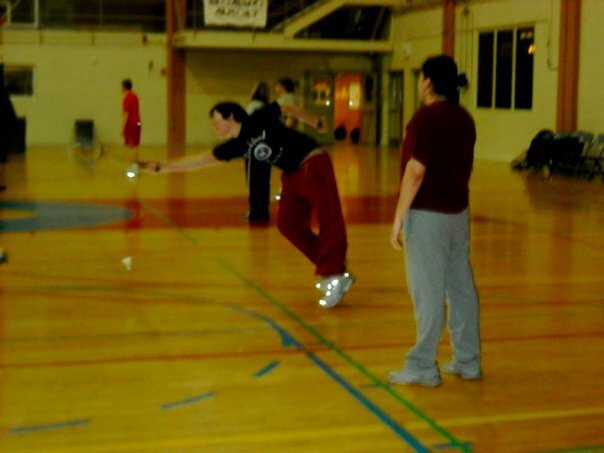 I was one of three people who actually stayed taped to the window for any amount of time, and I managed to hang in for a few minutes before not-so-gracefully falling face-first into my kind teammates’ arms. Because extra points are given when any foolish faculty or staff member can be talked into an activity, my team won enough for a first place finish. Hoo-ray! post post post the picture. I LOVE this adventure in adhesive! Adventures 4 and 5: The planned….